Elvis' White Piano For Sale - Misc. Elvis Presley's beloved white Knabe Grand Piano and bench as featured in his music room at Graceland from 1957 to 1969. Here we are present an elegant musical instrument, with wonderful provenance back to the 1930s, which was an emotionally-charged prized possession of the King himself: a Wm. Knabe & Co. grand piano, serial number 70545, refinished in white with gold trim per Elvis' personal specifications and under his direct supervision in 1957. 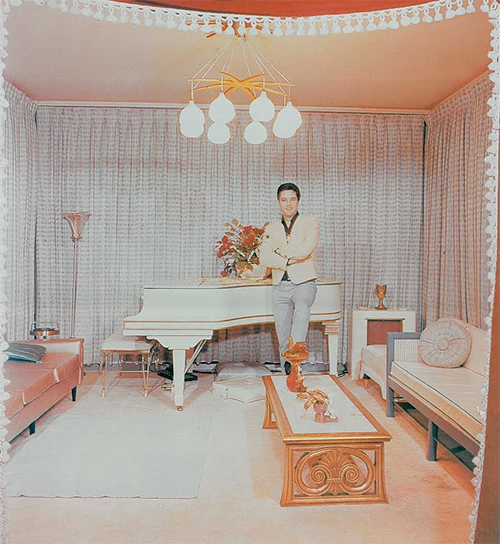 It is sold with the original white vinyl-cushioned bench on gold-colored metal legs as selected by Elvis to accompany the piano to his new home at Graceland. Included with this lot are letters of authenticity from Ron Blackwood, George Klein, Ted Sturges and C. B. Colthard, each attesting to a portion of the intriguing background of this fascinating piece of musical history.